In the fast-moving field of consumer electronics, sales teams work hard to stay ahead of the pack. As each company advances in the market share race, the competition eagerly seizes every opportunity to surge ahead. These companies have no time for inefficiencies. Survival depends on continuous quality improvement at every stage, from R&D to assembly to distribution. Companies that tolerate inefficiencies never make it to the finish line. TerrAlign understands the rules of the game. Do it better, faster, cheaper – or someone else will. An expert in the field of sales territory management, TerrAlign knows what the sales force needs to stay in the lead and has the deep industry knowledge necessary to give electronics companies that competitive edge. The following case study illustrates the experience of one TerrAlign customer, a Global 500 Electronics Company, that recognized the need for a more efficient and streamlined sales force. The company chose TerrAlign over competitive solutions for its integration and collaboration capabilities. Using TerrAlign’s Sales Territory Planning solutions, the company quickly increased efficiency, cut time in the planning and realignment processes, and paid back their investment in TerrAlign within 12-18 months. 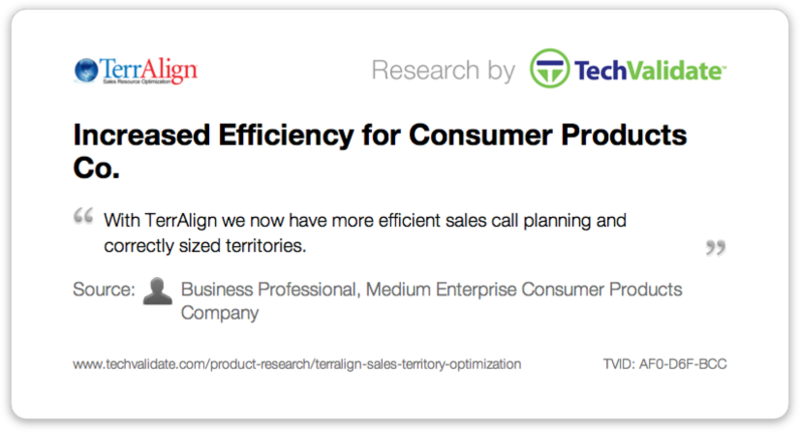 Read the case study to learn how electronics companies can improve sales force efficiency and gain a competitive edge with TerrAlign’s Sales Territory Planning solutions. Join TerrAlign in Boston for the Networking, Breakfast and Panel Discussion 2014 Q1 on February 27, 2014. The event will take place from 7:30 am – 9:30 am at the University of Massachusetts Club. Panel discussion will focus on emerging trends affecting sales force productivity, including adapting to changing buyers, moving selling processes online, and high-return sales force productivity investments. Panelists will include TerrAlign’s Ken Kramer, Vice President Sales and Marketing. The event is open to Sales Management Association individual, team, and corporate members. Case Study Demonstrates how One Media & Entertainment Company Increased Revenues through Strategic Sales Resource Optimization. The TerrAlign Group, a leading provider of Sales Resource Optimization solutions, recently released the results of an independent study by TechValidate that illustrates how TerrAlign customers can increase sales revenues through strategic sales resource optimization. The case study summarizes the experience of a Global 500 Media & Entertainment Company that wanted to improve their ability to compete in desired markets, streamline the sales planning process, and lower the time spent making change requests. The company selected TerrAlign over other vendors for its optimization capabilities, integration with existing CRM and SPM systems, and ease of use. Read the case study and learn how TerrAlign can help your company increase revenues through strategic sales resource optimization. Join TerrAlign in California for the San Francisco Bay Area Chapter – Inaugural Chapter Networking Breakfast and Panel Discussion 2013-Q1 on February 22, 2013. The event will take place from 7:30 am – 9:30 am at the Sheraton Palo Alto Hotel. The panel will discuss the Sales Management Association’s current chapter focus topic: 2013 Sales Strategy and Planning. Panelists will include TerrAlign’s Ken Kramer, Director of Business Development. The event is free and open to Sales Management Association members and guests. You are currently browsing the archives for the Sales Territory Planning category.